Since its creation in 1999, much of the BRT's work has focussed on preparing detailed recommendations for submission to the Government of Japan, the European Commission and the European Council. These recommendations are drafted by the BRT's various Working Parties for adoption at the next annual meeting. 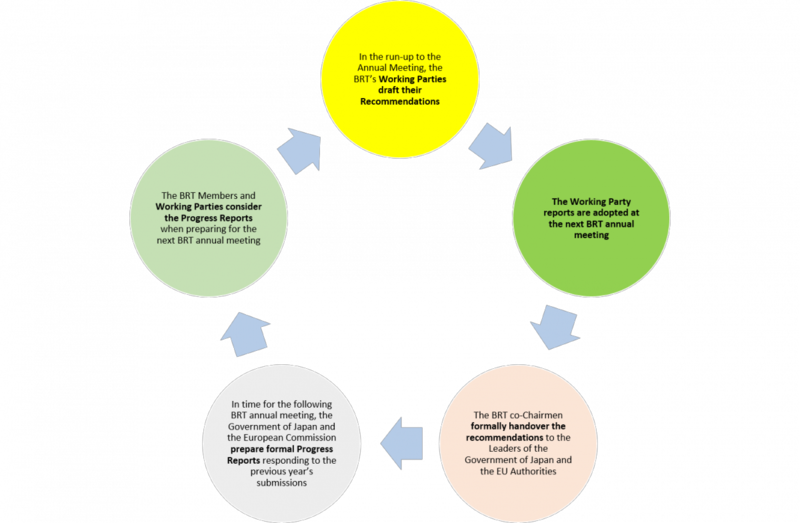 In order to further [its] objectives..., the BRT establishes Working Parties to prepare and follow up both the discussions at BRT meetings and BRT joint recommendations. Working Parties address regulatory and policy issues of common concern to business in both the European Union and Japan, where BRT input – in the form of recommendations to the Authorities on regulatory reforms and/or other policy initiatives - will add value. Any Member can make a proposal for a new Working Party. The proposal must have the support of both the Co-Chairs, who must check that it will be backed by at least one Member from each side, prior to its being submitted to the BRT Annual Meeting for discussion. WP2 Life Sciences & Biotechnology, Healthcare and Well-Being Bayer Holding Ltd. Chugai Pharmaceutical Co., Ltd. Many recommendations are agreed by both sides of the BRT and submitted to both the Government of Japan and the EU Authorities, others may be proposed by just one side of the BRT and/or addressed to just one Authority.